Is eternal life a blessing or a curse? That is what young Winnie Foster must decide when she discovers a spring on her family’s property whose waters grant immortality. Members of the Tuck family, having drunk from the spring, tell Winnie of their experiences watching life go by and never growing older. But then Winnie must decide whether or not to keep the Tucks’ secret—and whether or not to join them on their never-ending journey. Is eternal life a blessing or a curse? Note: Page numbers listed below refer to the trade paperback edition. that, you're stupid." Who is really selfish and unintelligent here, and why? that change what you worried about and how you interacted with other people? storm here? How is the weather related to the plot of the story? do you identify with more? lawyer. What would you say to the court in her defense? thoughts on death changed (if at all)? 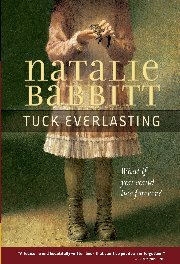 >hrNatalie Babbitt (1932–2016) is the award-winning author of the modern classic Tuck Everlasting and many other brilliantly original books for young people. As the mother of three small children, she began her career in 1966 by illustrating The Forty-Ninth Magician, written by her husband, Samuel Babbitt. She soon tried her own hand at writing, publishing two picture books in verse. Her first novel, TheSearch for Delicious, was published in 1969 and established her reputation for creating magical tales with profound meaning. Kneeknock Rise earned Babbitt a Newbery Honor in 1971, and she went on to write—and often illustrate—many more picture books, story collections,and novels. She also illustrated the five volumes in the Small Poems series by Valerie Worth. In 2002, Tuck Everlasting was adapted into a major motion picture, and in 2016 a musical version premiered on Broadway. Born and raised in Ohio, Natalie Babbitt lived her adult life in the Northeast.